COME SEE UNM PROFESSOR EMERITUS DENISE SCHULZ’S ALT DIRECTORIAL DEBUT! ALT is thrilled to have UNM Theatre Professor Emeritus Denise Schulz at the helm of “Cat on a Hot Tin Roof”! Denise (seen here in the blue sweater) has had a long, fantastic career in the Theatre Arts, as a professor, director, and mentor. She is bringing her talent and knowledge to ALT, leading the dedicated cast of “Cat on a Hot Tin Roof”. 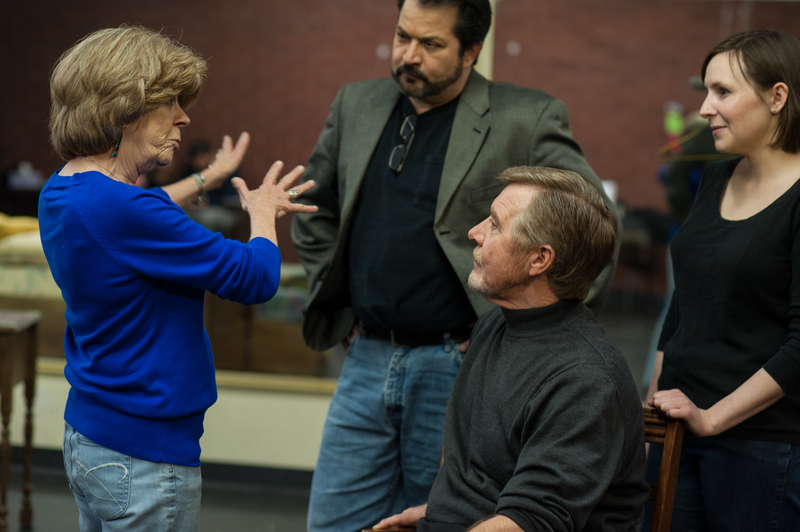 It’s no small task to bring one of Tennessee Williams’ most famous shows to life, but Denise is doing a fantastic job. We can’t wait to share the end result of her hard work, and the hard work of this incredible cast, with you. You’re gonna love it! So get your tickets today — (505) 242-4750 x2 or www.albuquerquelittletheatre.org “CAT ON A HOT TIN ROOF” RUNS APRIL 12 – 28! We’ll see you at the show! ← ALT ANNOUNCES CAST FOR “THE PRODUCERS”!